Robyn & Jason’s wedding was held at Larsmont Cottages, a cozy venue for more intimate weddings. At the time of their ceremony it was snowing sideways and maybe about 10º F – chilly for an outdoor wedding, even in Minnesota. Despite the conditions, these two, their family and guests all witnessed a lovely outdoor ceremony on the back patio of the resort. 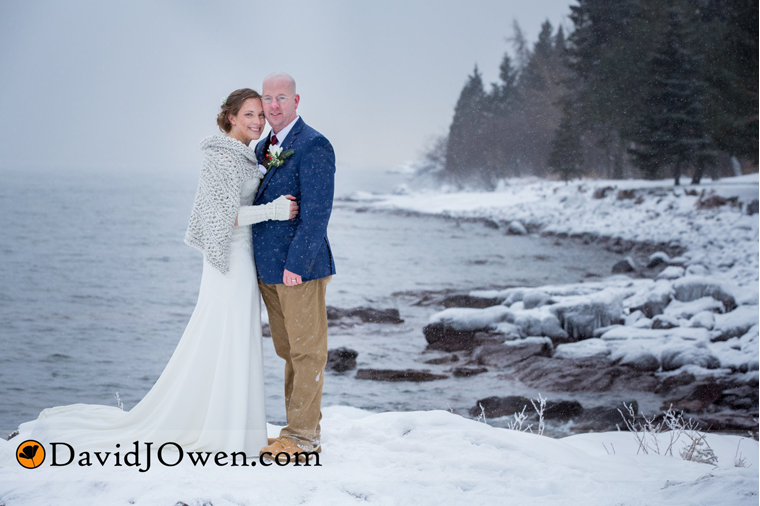 After the ceremony, Robyn & Jason (dressed for a wedding, not winter sports) gamely took advantage doing photographs with the lovely Lake Superior winter backdrop we were offered. Way to brave the cold and big congratulations you two!